The press release about Wells Fargo’s first Talking ATMs in Utah was issued as a result of a Settlement Agreement negotiated using Structured Negotiations by Lainey and co-counsel Linda Dardarian on behalf of the Utah Council of the Blind and the Iowa Council of the Blind. The full Settlement Agreement, is posted in the Talking ATM Settlements Category. Salt Lake City, Utah (January 16, 2002) — Wells Fargo & Company and the Utah Council of the Blind announced today that Wells Fargo Talking ATMs are now up and running at approximately 58 locations across the state. A rollout of Automated Teller Machines (ATMs) with audio capability will continue through 2002 in Utah. Through voice instruction, the new Talking ATMs tell users who cannot read information on an ATM screen how to deposit money, withdraw cash, transfer funds and buy stamps. In addition, customers can use the new Talking ATMs to hear account balances for primary checking, savings and market rate accounts. To protect the privacy and security of blind and low vision users, the Talking ATMs deliver voice information privately through audio jacks and earphones. 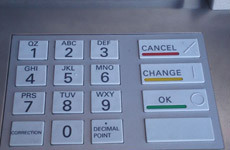 Customers can identify a Talking ATM by the audio decal on the front of the machine and the earphone decal near the earphone jack. Both of these decals are in large print and Braille. Working with the California Council of the Blind, Wells Fargo announced in June of 1999 that it would pilot 20 Talking ATMs in California, and now over 800 Talking ATMs have been installed in that state. Following the success of the California effort, Wells Fargo began installing Talking ATMs at various locations across the country. Customers can find the Talking ATM nearest to them by calling (800) 869-3557 or by visiting www.wellsfargo.com and clicking on the Talking ATM Locator link at the bottom of the screen. Lainey Feingold and Linda Dardarian, two California lawyers who have assisted members of the blindness community nationally on this issue, also applauded Wells Fargos efforts. “We congratulate Wells Fargo for its pioneering approach and innovation in providing Talking ATMs that benefit both the blindness community and all people in Utah who have difficulty reading the ATM screen,” said Feingold. We are committed to serving all of our customers and are delighted to be offering this enhanced ATM access to better meet the needs of blind or low vision Utahns, said Robert A. Hatch, Wells Fargo President & CEO for Utah & Southwest Wyoming. “We were the first in the country to draw up a plan for developing and installing Talking ATMs, and we are pleased that Talking ATMs are now available in Utah. The Utah Council of the Blind (UCB) is an affiliate of the American Council of the Blind, representing blind and visually impaired persons across the state of Utah. UCB works to elevate the economic, social and cultural level of the blind and visually impaired of Utah. The Utah Council of the Blind can be reached at (801) 292-1156. Wells Fargo is a diversified financial services company with $308 billion in assets, providing banking, insurance, investments, mortgage and consumer finance from about 5,400 stores and the Internet (http://www.wellsfargo.com) across North America and elsewhere internationally. In Utah, Wells Fargo has more than 150 banking locations and nearly 4,000 team members. Wells Fargo Bank Northwest, N.A. This document is the press release about Wells Fargo’s first Talking ATMs in Utah. The Utah Council of the Blind reached an agreement with Wells Fargo without filing a lawsuit. They used a method called Structured negotiations. Lainey Feingold and Linda Dardarian were the lawyers. When this press release was issued the bank had 58 Talking ATMs in Utah. In 2008 every Wells Fargo ATM in the United States was a Talking ATM.